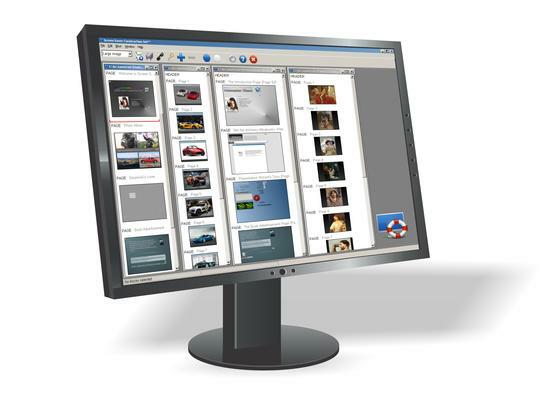 Screen Saver Construction Set is the ultimate platform to build distributable multimedia Windows screen savers. Fast, flexible and easy to use, it will let you assemble screen savers of your own design out of pictures, animations, video, text and sounds. Its resolution-independent architecture means that your screen savers will look superb no matter what system they're installed on. The built-in Photo Album Wizard will assemble screen savers from your digital pictures with a few clicks. Activate the On Close processor in your screen savers to optionally direct users to your web pages — screen saver ads rock. Once you've created your screen savers, you'll be able to wrap them in professional Windows .MSI installers for distribution. The extensive documentation and tutorials included with Screen Saver Construction Set will typically get you up to speed in less than twelve seconds. Your performance may vary slightly, but it will still be impressively quick. Build screen savers of your family, your corporate logo, advertisements for your products, desktop themes or your most inventive fantasies. Import graphics from many other popular Windows applications. Add sound effects and background music to your screen savers. Include sophisticated animations in your screen savers. Add applets of your own devising. Embed videos in your screen saver content. Distribute your screen savers with no run-times or DLLs to lose. Create professional Windows installers for your screen savers. Should you wish to contact us about this application, please send us some e-mail. IMPORTANT: Screen Saver Construction Set requires access to the Internet to validate itself after installation. Please see the discussion of registration key security for a detailed discussion of this functionality. Click on one of the following links to download Screen Saver Construction Set 9.0a revision 2. This file is 26,928,640 bytes in length. As of this writing, if you have previously registered or upgraded to Screen Saver Construction Set 8, you can still upgrade to Screen Saver Construction Set 9 for half price. We are able to provide some limited support for the version 8 software, but it's becoming increasingly vulnerable to changes in Windows and some third-party security products. Screen Saver Construction Set 6 and 7 have reached thir ends-of-life, and they have been removed from distribution. We no longer have replacement installers for these product. We are able to provide replacement registration keys and limited support for Screen Saver Construction Set 7. We recommend that you register Screen Saver Construction Set 9. Screen Saver Construction Set 2 has reached its end-of-life, and it has been removed from distribution. We no longer have replacement registration keys or installers for this product, and support for it has ended. We recommend that you register Screen Saver Construction Set 9. Note that Screen Saver Construction Set 9 does not open screen savers created by Screen Saver Construction Set 2 at this time. Please be sure to review the terms and conditions for distributing Screen Saver Construction Set's screen savers. There's nothing particularly ominous therein, but the lawyers would have screamed loudly enough to have been heard in Patagonia if we hadn't included them. Screen Saver Construction Set™ is a trademark of Alchemy Mindworks Corporation. The monitor graphic is used under license from DryIcons.